Amma’s plane from Dubai was due to land in Trivandrum at 3:30 p.m., we calculate that it will take three hours for Her to arrive at the ashram, that is, by 6:30 p.m. Just to be sure, residents start lining up by 4 p.m.! At 5 p.m. they begin to chant the Lalita Sahasranama. Twice, the entire group jumps up excitedly, “Amma is coming,”only to realise it’s a false alarm! At 6:30 p.m. Amma’s car pulls up in front of Her room. The residents, overcome with emotion, surround Her. Amma walks through the milling crowd, smiling to one and all. Amma walks up the steps to Her room so that everyone can see Her. She speaks a few words, recounting some amusing incidents from the trip. Everyone laughs! Then folding Her hands in prayer, She turns to go to Her room. Amma then comes to Her balcony and gazes silently at Her children with a blissful smile. Yes Amma, please swallow us up! So we can be with You forever. On the morning of the 19th, at 5 a.m. there was congregational Lalita Sahasranama chanting, in which thousands of devotees participated. At 7.30 a.m. there was Vedic incantations by the students of Tantra Vidyapeetham, Aluva, followed by an inspiring talk by Swami Amritaswaroopananda. At 7.45 a.m. Amma was escorted to the dais, beneath a ceremonial umbrella held by one of the disciples. As She walked through the pathway in the centre of the vast auditorium, devotees were offering flower petals at Her feet amidst the chanting of Om Amriteswarayi Namah, which reverberated in the atmosphere. Having prostrated to the gathering of devotees Amma sat on the ceremonial peetam and then Swami Amritaswaroopananda and Swamini Krishnamrita Prana along with other disciples performed the pada puja. The playing of Panchavadyam (traditional instrumental music) by the children of Amrita Niketanam, Parippally, added to the devotional mood of the moment. Swami Amritaswaroopananda then led the chanting of the 108 holy names of Amma, in which tens of thousands of devotees joined in. After the pada pooja there was the birthday sammelan (function), in which Dr. Murali Manohar Joshi, union minister for human resources development, was the chief guest. After the welcome speech by Dr. Prem Nair, Swami Amritaswaroopananda presented a memento to Dr. Joshi. Dr. Joshi then inaugurated the fourth phase of the Amritakuteeram project (a project for constructing 25000 houses for the homeless poor, 5000 every year) and also handed over the master key to the 5000 houses constructed during the current year. Amritayanam, a Sanskrit epic poem, describing the life and deeds of Amma, authored by Sri. Muthukulam Sreedhar was released by Prof.M.K. Sanu, scholar and cultural emissary, and received by Kavalam Narayana Panicker, noted poet and playwright. Unmayilekkunaru, Amma’s address at the UN millennium peace summit of religious and spiritual leaders, was released by Sri.P.Parameswaran, Director of Bharateeya Vicharakendra and received by Sri. PV Chandran, Managing Editor of Mathrubhumi daily. Jyotir Gamaya, Pearls of Wisdom from Amma, was released by Sri. O.Rajagopal, Minister of State for Railways and received by K.M.Mathew Chief editor of Malayalam Manorama. Bhajan cassettes sung by Amma and Her disciples were released by Sri Sreekumaran Tampi, Film Director, and received by Sri Kamal.V.Rao, District collector, Kollam. Swami Poornamritananda delivered the vote of thanks. Amma then distributed the prizes to the winners of the Matruvani campaign. This was followed by Amma’s darshan in which She individually received and blessed tens of thousands of devotees. The Darshan went on till late in the afternoon. Also there will be Devi Bhava darshan in the evening, which continued throughout the night into the morning of the 20th. Nearly a lakh of people participated in the birthday luncheon. The birthday programs went on smoothly and orderly owing to the elaborate arrangements made by the ashram authorities. Facilities such as 24-hour medical booth, ambulances, fire engines, closed TV circuits, water supply in polythene bags, etc. were provided for the convenience of devotees. Above all, the birthday celebrations bore witness to Amma’s infinite capacity for giving, Her readiness to go to any extent for the joy and comfort of Her children. We all once again witnessed Her performing the superhuman task of receiving and blessing individually more than half a lakh of people within 24 hours. Throughout every minute of the celebrations She was the very picture of sweetness, compassion, patience, love and humility. Her life and deeds, which excel the beauty of Her words, is Her real message to the world. “Should Amma go to Dubai? Is it really necessary? Isn’t it dangerous to go to a country where there is no religious freedom?” These were some of the doubts and questions expressed by the devotees when they heard about Amma’s decision to go to Dubai. Because I had been visiting Dubai and other Middle East countries since 1994, Achchan thought I would be the right person to give him a clear picture of the situation there. I tried to reassure him and said, “There are good and bad people all over the world. There are many broad-minded people in the Middle East as well. I have been visiting those countries for several years now, and I have never had any problems. In fact, I’ve had the great fortune to meet some wonderful human beings there. It is also important to remember that Amma is not a complicated person at all and Her message is so simple. Everyone can easily understand Her language, the language of the Universal Mother. So there’s no need for you to be concerned. Poor Achchan and Damayanti Amma. They’d had enough trouble. Due to the constant problems created by the atheists and the local rationalist group of young men, they literally lived in fear when Amma first began the Krishna and Devi Bhavas. For them, those days were like a nightmare, and they hadn’t forgotten it. However, none of us can even fathom the divine sankalpa (resolve) of a Satguru (realised being) like Amma. It is far beyond the capacity of any mortal human being to understand what the actions of a Satguru mean. There were a lot of opinions both for and against Amma’s first visit to the United Arab Emirates. But finally, Amma decided to go to the land of the famous Arabian stories. I left for Dubai before Amma on the 23rd, just after Amma’s birthday celebrations, to help the devotees organise the programme. In three days we convened as many meetings as we could, discussing, planning and making decisions about the many aspects of Amma’s visit. The first announcement about Amma’s willingness to visit Dubai had come on 15th September. As far as I remember, this was the first programme of Amma’s that we had ever planned and organised in just a week and a half. When Amma arrived in Dubai, Mr. Masood Muhammed, Managing Director, Civil Aviation, Dubai airport, Mr. Murali Nair, Financial Director, Civil Aviation, Dubai airport and Mr. Jayaram received Amma inside the aircraft. A limousine was waiting for Her beside the aircraft, and Amma was driven to a special V.I.P. lounge, where Mr. Ahmed Lutfi, Director, Finance Ministry, Dubai and his wife were waiting for Her. Three public programmes were planned in Dubai, two of them in a gurudwara at a place known as Alkus, and the last day’s darshan was to be held at Hotel Astoria. But owing to the uncontrollable crowds, the morning darshan on the third day had to be shifted from the hotel to a bungalow belonging to Mr. Pagaria (Chairman, Al Mayalals Group of Companies). Amma also visited Mr. Vasu Shroff’s (Chairman, Regal Group of Companies) office and gave darshan to his family members and employees. Even though we hadn’t originally planned any morning darshan programmes, the news about Amma’s visit spread like a wild fire and people arrived from all over the Middle East. They began to queue up in front of Mr. Jayaram’s (Amma’s host in Dubai) house from 6 a.m. onwards. Except on Friday, 29th September, the programmes began at 4 p.m. and ended at 2 or 3 in the morning. The first evening programme began with Mr. Ahmed Lutfi’s introductory speech. He welcomed Amma to Dubai and garlanded Her. His talk was short but very sweet. (Mr. Lufti’s speech) After the speech, Mr. Lutfi presented Amma with a rosary specially strung for Her at his home. Thereafter devotees from Muscat, Kuwait, Bahrain, Sharjah, Abu-Dhabi, Salala and other Middle East countries also garlanded Amma. When Mr. Ahmed Lutfi spoke the entire crowd became very excited. They expressed their appreciation and rejoiced by applauding at his every statement about Amma. It was quite thrilling to watch this orthodox local Muslim in his traditional dress talking about Amma to a huge gathering. I was so impressed by his broad-mindedness and readiness to accept a Mahatma belonging to a different faith. In him I saw the courage of a true lover of humanity. Indeed, he is a genuine believer and a servant of God. On the first evening there were about 8000 people according to the tokens issued. Realising that the token system was an utter failure, we discontinued it on the second day. Eleven thousand people came the second day. Hameed, as he was called, continued, “Every single letter I receive from my village contains a description of my family’s intense pain, especially when they see or hear about others who have returned from the Gulf to spend time with their families. Amma, just as they long to see me, my heart is pining to see them. I keep thinking about my poor daughter. Every day she is waiting for her father to come back. Amma, I am not even permitted to stay here legally now. What am I to do? Having said this, the young man cried uncontrollably with his head resting in Amma’s lap. Amma was now wiping the tears that were coursing down Her own cheeks. She hugged Hameed and consoled him, saying, “Son, have courage. When times are bad, everything seems to fall apart. Be optimistic and patient. Every experience is like a passage. Some of those passages are filled with light and joy, while others are dark and painful. Amma knows it is hard to go through the painful ones. Ordinary human beings have very few choices. Committing suicide might put an end to your suffering. But what about the ones who are still alive? They will continue to suffer. In fact, their pain will be much worse than before, as you have ended your life and have left them alone to face the challenges of life, without any help. Do you think that they can bear the immense pain of losing you? Son, don’t jump into conclusions about life. Everyone goes through good and bad times. The light is just around the corner. You will be all right. Amma will make a special sankalpa for you. The young man looked greatly relieved and relaxed as he walked away from there. I saw him again in the darshan line that evening at Mr. Lulla’s (Chairman, Astoria and Ambassador Hotels) bungalow. This time he was in a very happy, jovial mood. Out of curiosity, I listened to his conversation with Amma. He told Amma that one of Her devotees, a very well placed person in Dubai, had suddenly offered to help him to sort out his difficult situation. He expressed his deep gratitude to Amma for Her Divine intervention. The above incident is not the only one of its kind. Hameed’s experience is just one among thousands of a similarly painful experiences that the helpless labourers of the Gulf countries face in their everyday life. During the first and second day, I was involved in controlling the crowds. In their excitement to get a glimpse of Amma and to receive Her darshan, people became so impatient that they broke all the darshan rules, which, for practical reasons, had been formulated by the local devotees. During those chaotic moments I had to make a sincere attempt to pacify the devotees and assure them that Amma wouldn’t leave the place until everyone had received Her darshan. Standing in the middle of the extremely impatient, anxious crowd, I had to physically fight through the mass of people to protect a mother, her small children and myself from being stampeded by the violent crowd. The place was jam-packed. Looking at the crowd, I was amazed to see a vast ocean of people surrounding me. They had been waiting for seven hours to come up to Amma for Her darshan. I couldn’t help but wonder at the tremendous attraction people have towards Her. Though it was eleven in the evening, the heat of the sun could still be strongly felt in the air. Everyone’s clothes were soaked in sweat as though they just had a good swim in a river. Let me say without any exaggeration that Amma’s trip to the United Arab Emirates was an unforgettable event. The devotees experienced an unending shower of Amma’s infinite love, which they really deserved. Among the people who came so see Her were the unskilled Indian labourers who worked for long hours in the scorching heat at construction sites, or at other menial jobs, who were now being given a rare opportunity to experience the beauty and fragrance of true love. Fighting with the elements, day in and day out, these people had forgotten how to really live. For them, the time they had with Amma was like being in heaven. Carrying the burden of their family and worldly responsibilities, these people work day in and day out to make money to support themselves and their families. Even when they go back to see their families once a year, the joy of meeting their family members usually doesn’t last long, because all the money they have earned through years of hard work will disappear within a few days. When it is time for these poor people to return to their workstations in the Arabian countries, the bank balance of most of them will be nil. And once a person is penniless, everyone, including his close relatives and friends, will disappear, leaving him and his immediate family alone to face their difficulties. At this point, the main interest of the so called friends and relatives will be to know when he is going back to the Gulf. Friends who have sipped from the liquor bottles he has brought will turn their backs on him and go in search of other new returnees to share bottles with. When these people go back to the Deserts of Arabia after a one or two month visit at home, they still have the same old load on their shoulders, with some newly added burdens to the already existing ones. They have no choice but to continue to sweat and toil, and they dream about a bright and happy future with their wives and children. Countless such people live their lives building castles in air. How many of those dreams materialise? It is a terrible tragedy that many of these men wither away at the bud stage – before they ever get the chance to blossom. Struck with awe, I have been watching this incomprehensible phenomenon known as Amma for the last twenty years. To me, She continues to be an unresolved mystery. Not just one aspect or mood, but whatever is being expressed by Amma has tremendous depth. As human beings, it is our nature to search for a meaning to everything we hear and see. The origin or source of that search is the ego. The very existence of the ego is rooted in this search for meaning, which the ego will always interpret in its own way, without diving into the deeper realms of Amma’s responses. Her answers are not always verbal. In whichever form they come, we need to have the attitude of utter acceptance to be able to hear the true answer, the voice of our own Self. The iron filings may think it is because of their own power that they get attracted to the magnet. Poor things! How can they move at all in that direction without the power of the magnet? We, too, often have the same false notion as those iron filings. The “iron filings” in Dubai were simply drawn towards the most powerful magnet known as Amma. They didn’t know why? The attraction was so strong that they couldn’t be still. They just moved towards that great presence. The musk deer is constantly in search of the sweet smell emanating from its own body. This is what the entire human race is like. People are searching for the sweetness of life, the joy of living. In that search they are scattered in their thoughts, words and deeds. As Amma puts it, “We all are like totally isolated islands scattered in an Ocean. There is no glue – the glue of true love – to unite us.” Amma is the unconditional Love that we are searching for, the God of Love who will ultimately lead us to eternal peace, happiness and oneness. Amma has come to wake us up from our deep sleep of ignorance which we have been immersed in since time immemorial. In the light of Amma’s all-embracing love and divine beauty, let us slowly progress towards the goal and find true meaning and fulfilment in every aspect of life. I am immensely delighted to welcome Her Holiness Mata Amritanandamayi Devi to Dubai. Amma has demonstrated by Her very life that human hearts can be won by pure and selfless love. If only all humanity can have this attitude towards their fellow beings then this world would be the heaven that we have only heard about and not experienced. Leaders like Amma teach us that peace cannot be bought at the negotiating table. Peace has to be earned out of selfless love. Amma has toured the world several times over the past two decades, spreading Her message of peace and love to all without any difference of religion, class or creed. Her tender and loving embrace moves the heart of each and everyone and makes them feel like innocent children in the arms of their own mother. I welcome Amma on behalf of all my brothers and sisters. Along with all of you I too join palms in humble prayer for the peace and harmony of the entire humanity. Scene 3: Having received Amma’s darshan, the passengers now look very happy and relaxed. They settle down in their seats. Now the entire crew, including the pilot and the co-pilot, queue up for darshan. We were beginning to wonder who was flying the plane! But what could the pilots do? Their attraction to Mother was so strong, and they were waiting like everyone else for their turn in the line. So each one of them received a motherly hug. They also heard the sweet music of Amma’s whisperings of grace, received an unforgettable, radiant smile and a candy prasad from Her which lightened up their hearts and souls. Amma’s last scheduled darshan at the ashram for the next two months. Crowds of devotees, eager to have Amma’s darshan before Her long absence, have been arriving in the ashram since the previous night. By 11 a.m. the temple is packed to capacity. Amma comes at 11:15 a.m., bows to the waiting devotees, and proceeds to give darshan. What a darshan! Amma is blessing people at a fast pace in order to see Her each and every child. Even though each person gets but a few seconds, they leave Amma’s embrace comforted and spiritually uplifted. Hundreds of people, believing there would be Devi Bhava that night, continue to stream through the ashram gates throughout the morning and afternoon. They quickly enter the darshan queue when they realise that Devi Bhava is cancelled, and this is their only chance to see Amma before the tour. The hours keep going by, 3, 4, and 5 o’clock. Normally, daytime darshan never goes past 5 p.m. and here it is now 6! Many of the residents are concerned because Amma hasn’t eaten anything all day. By the time Amma sees the last person, night has already fallen! It is 6:45 p.m. – past the time for bhajans (generally bhajans start at 6:30 p.m. and on most days Amma comes for the bhajans). Many are relieved when the long darshan is over: Amma can finally return to Her room and have some food and rest. But Amma does not go. Much to everyone’s surprise, She declares that She will be leading the bhajans herself! She takes Her seat in front of the microphones, pulls Her shawl over Her shoulder, where the tear stains of thousands of devotees have left their mark, and closes Her eyes in deep meditation. With eyes still closed, She begins to smile blissfully. A radiance emanates from Her. She reveals to us the exalted state She dwells in, which is unaffected by physical discomfort. After bhajans are over, Amma walks to Her room. One devotee, who has yet to receive darshan, waits anxiously for Her. That devotee is Ram the elephant! Amma takes a handful of biscuits and holds the treats behind Her back or over Her head. Ram’s trunk searches for the biscuits. With this game, Amma makes Ram completely concentrate on Her. When the last of the biscuits or bananas disappear into Ram’s mouth, Amma starts up the stairs. Ram tries to follow, but does not get very far as his big body cannot fit in the narrow staircase! Even Ram cannot stand being separated from Amma! When there are fifty thousand or more devotees in Amritapuri to celebrate Amma’s birthday, ‘living with Amma’ has a new meaning. It no longer means you sit with Her for meditation and satsang in the morning, as normally happens three days a week; nor does it mean you sit quietly in the temple, a yard or two away, watching Her give darshan, as you can on the other four days of the week. No, ‘living with Mother’ on such days generally means distance – you are not likely to be close to Her Form, for you are working hard, at lots of jobs you don’t ordinarily do. Maybe you ordinarily work in the ashram press, but on this special day you are needed to make food for the thousands that throng to have a glimpse of Amma, or to serve food. Maybe you usually work in one of the offices – say, the School or Accommodation Office; but for Amma’s Birthday you have the every-couple-of-hours toilet cleaning duty. Perhaps on an ordinary day you work in the café or the small grocery store at the ashram; but on this day you are delivering leaf plates to the various food counters where devotees take their meals. Maybe your ordinary work keeps you in front of a computer most of the time – but on Mother’s Birthday you are not at your screen; you are helping with crowd control in the big new semi-outdoor auditorium at the south side of the ashram. Or, did you leave your Matruvani editing job to help distribute pensions to the poor who gathered near the hospital south of the ashram? Whatever you found yourself doing on 19 September 2000, it almost surely was not what you usually do unless you were Amma. Amma did what She usually does. Of course, some details were different: She did come a little earlier than usual, and head out to the new auditorium instead of to the temple. The sound of the conch reverberated throughout the hall announcing Her arrival, thousands of throats chanted ‘Om Amriteshwaryai Namah’ or called out ‘Amma, Amma’ a wave of love and devotion engulfed all. And when Amma got to the stage – She sat still, eyes closed, hands folded, the perfect image of humility, while one disciple, on behalf of all, performed a formal Pada Puja to the chanting of Vedic mantras. Next, satsang, and greetings to dignitaries, and awards to Matruvani subscription competition winners, and keys to new homes for the poor. Yes, there were these little deviations from Mother’s ordinary day. But in the end She did what She always does: She sat hugging, whispering, listening, reassuring, caressing, scolding, patting, smiling, consoling – in short, interacting with each one who approached Her in the way he or she needed. Amma gave darshan, in Her own unique and truly inimitable way. When there are fifty thousand or more devotees in Amritapuri to celebrate Amma’s birthday, “living with Amma” has a new meaning. It no longer means you sit with Her for meditation and satsang in the morning, as normally happens three days a week; nor does it mean you sit quietly in the temple, a yard or two away, watching Her give darshan, as you can on the other four days of the week. No, “living with Mother” on such days generally means distance – you are not likely to be close to Her Form, for you are working, hard, at lots of jobs you don’t ordinarily do. Maybe you ordinarily work in the ashram press, but on this special day you are needed to make food for the thousands that throng to have a glimpse of Amma, or to serve food. Maybe you usually work in one of the offices – say, the School or Accommodation Office; but for Amma’s Birthday you have the every-couple-of-hours toilet cleaning duty. Perhaps on an ordinary day you work in the cafe or the small grocery store at the ashram; but on this day you are delivering leaf plates to the various food counters where devotees take their meals. Maybe your ordinary work keeps you in front of a computer most of the time – but on Mother’s Birthday you are not at your screen; you are helping with crowd control in the big new semi-outdoor auditorium at the south side of the ashram. Or, did you leave your Matruvani editing job to help distribute pensions to the poor who gathered near the hospital south of the ashram? Whatever you found yourself doing on 19 September 2000, it almost surely was not what you usually do unless you were Amma. Amma did what She usually does. Of course, some details were different: She did come a little earlier than usual, and head out to the new auditorium instead of to the temple. The sound of the conch reverberated throughout the hall announcing Her arrival, thousands of throats chanted ‘Om Amriteswaryai Namah or called out ‘Amma, Amma’ a wave of love and devotion engulfed all. And when Amma got to the stage – She sat still, eyes closed, hands folded, the perfect image of humility, while one disciple, on behalf of all, performed a formal Pada Puja to the chanting of vedic mantras. Next, satsang, and greetings to dignitaries, and awards to Matruvani subscription competition winners, and keys to new homes for the poor. Yes, there were these little deviations from Mother’s ordinary day. But in the end She did what She does always: She sat hugging, whispering, listening, reassuring, caressing, scolding, patting, smiling, consoling – in short, interacting with each one who approached Her in the way he or she needed. Amma gave darshan, in Her own unique and truly inimitable way. The birthday of Amma was celebrated around the world, with the message of spirituality, love and selfless service being proclaimed far and wide. The Amritapuri ashram became an ocean of humanity, bubbling with enthusiasm when tens of thousands of devotees from every part of the country and abroad poured in to participate in the birthday celebrations of their beloved Mother. Today is a day when festivity blends with tyaga, the spirit of renunciation. We give new impetus to samskara through tyaga. Today is a day to revive the samskara handed down to us by the rishis. Life becomes a festival when we forget our egoistic self and engage wholeheartedly in selfless deeds, rejoicing in this. When enthusiasm combines with samskara, it becomes a true celebration. A festivity with good samskara is like the innocent smile of a baby. It elevates us towards God. A festivity without samskara, on the other hand, pulls us down towards animal nature. Today our culture is facing grave challenges, which can be observed in family life, education, politics and many other aspects of life. Good samskara originates from spiritual understanding. Spirituality is the science that makes life meaningful; it is the art that brings beauty to life. We have to imbibe spirituality – the art and science of life – for this will make our lives truly fulfilling. We have to understand spirituality in order to enjoy life in its fullest measure. In fact, spirituality is the basis of all other fields of knowledge. Yet, even so, people do not give it any importance in their lives. Today our children and our youth blindly imitate the West, forgetting the real values of life. As a result, they are losing their identity. The mind of a child is like a cement coating that is still fresh and wet. The impressions, once made, cannot be erased easily. Unfortunately, the first impressions children receive today are the impressions of maya (illusion). So it is important that we develop good samskara in our children when they are still young. If a mould is defective, every product that comes out of that mould will be defective. Today we learn a lot of things at schools and colleges, but all that education is like a building without a solid foundation. As a result, schools and colleges have become battlefields, where students fight and even kill one another in the name of politics. Amma doesn’t reject politics, but everything has its own place. Students today have become like walls and the professors are like machines. The heart doesn’t speak to the heart, and as a result any real unfolding of the student’s personality, of his or her inner self, cannot take place. Through education students hope to become something, but they become something else – they become walking computers. Artificiality has taken hold of every aspect of life. Today we are living as though we are half asleep. We have no awareness, only information. Only when suffering comes to us do we become aware of ourselves. Even at the age of fifty people have no awareness of what their duty is; they are not aware of what they say or do. It is awareness, not just knowledge or information, which prevents a person from doing wrong. Awareness is a blending of knowledge and action. We worship our own creations, while we forget the One who created us. We should be rooted in our real Self instead of depending on others, who are subject to change at any moment. There should be awareness in our every word, thought and deed. We have every right to rejoice, but if we give up dharma, we will lose not only our happiness but also our identity. We have to get rid of our egoistic nature. It is the egoism in us that prevents us from both giving and taking. The one who becomes the servant of all, becomes the master of all. We have to overcome our anger if we are to live a peaceful life. Anger creates tension and destroys the harmony of life. Another highly important quality that we need to develop is contentment. Contentment is the real wealth of life. We are not the masters of our lives – it is God’s will that prevails. We should therefore perform our actions with humility and with the spirit of surrender. We shouldn’t become elated when we succeed, soaring like airplanes; nor should we go to pieces when we fail, sinking like submarines. We are always dependent on God’s grace, and that grace becomes available to us only through our selfless, compassionate actions. If there is to be any real social progress, the state of women has to improve as well. To hope for social progress, without caring about the plight of women, is like trying to fly with one wing! Amma concluded Her words with a passionate plea for people to go out and serve the poor and the suffering. Poverty is of our own creation, for in this world only people starve. Animals seldom starve, and when they do, it is because of the selfishness of humans. Amma’s inspiring talk replete with striking examples and stories delivered in Her sweet voice moved the devotees beyond measure. Finally, Amma led the devotees in meditation and prayers for universal peace and welfare. The pada puja (worship of Amma’s sacred feet), the most auspicious of the celebrations, took place at 9 a.m., immediately before Amma delivered Her birthday message. Then, after Amma’s speech, the people of Parayakadavu village presented Amma with a ceremonial offering, as a token of their love and devotion towards Her. In the Alappad Panchayat1, district of Kollam, Kerala state, South India, there is a small village named Parayakadavu. This village lies amidst an endless expanse of coconut palms stretching along a narrow peninsula separated from the mainland to the east by an intercoastal waterway, while the western shore of the village is buffeted by the sparkling blue-green Arabian Sea. The people of the village belong to a humble clan of fishermen who proudly trace their ancestry as far back as the sage Parasara. It is sage Parasara who married the fishermaid Satyavati, mother of Sri Veda Vyasa, the renowned codifier of the Vedas. There are many legends told about the sanctity and greatness of this village where daily life and social custom are still closely associated with divine myths, stories which the villagers strongly believe took place thousands of years ago. One such legend is as follows: Once Lord Subramanya2, son of Lord Shiva and Goddess Parvati, committed a serious error. Infuriated by the transgression of His son, Lord Shiva cursed Subramanya, causing him to be born as a fish. Dejected by the fate of her son, Parvati requested the Lord to forgive Subramanya’s fault. Instead of consoling Her, Shiva became more angry and condemned Parvati as well to be born as a fisherwoman. Later when Lord Shiva’s anger had subsided, He told Subramanya that He Himself would come and liberate both of them at the appropriate time and thus blessed them. 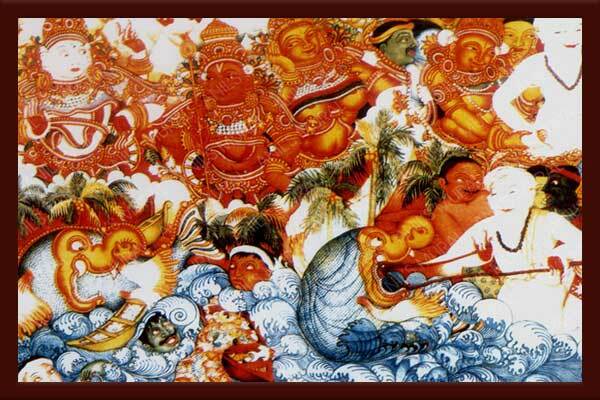 In accordance with Lord Shiva’s curse, Lord Subramanya assumed the form of a fish, rather, of a huge whale. Appearing in the sea of Alappad, the whale caused the fishermen terrible harm. Accustomed to fishing both during the day and night, the fishermen could now no longer venture into the seas. Sometimes the whale tore the cast nets of the fishermen to shreds, and at others it overturned their boats, endangering their very lives. The villagers were doomed to poverty and starvation. The king of the fishermen failed to find a solution. His treasury was becoming bankrupt, as he was feeding the starving people. Finally, in an attempt to solve the problem, he made a proclamation: the person who could catch the troublesome whale would be richly rewarded, and would also be given the hand of the king’s beautiful daughter in marriage. Yet the huge whale was so fearsome that nobody came forth to accept the challenge. The king and his subjects were completely disheartened, when an old man mysteriously appeared from the north. Nobody knew who he was. Approaching the king, his back bowed with age, he boldly declared that he could catch the huge whale and save the people from complete devastation. Accompanied by the astonished king and his subjects, the old man walked confidently toward the sea. Making a long rope by twisting long strands of vines, the old man threw one end into the sea while holding the other end tightly in his hand. The rope of vines encircled the place where the huge whale was lying submerged. Passing the rope to the fishermen, he instructed them to pull with all their strength while chanting a particular mantra. As instructed by the old man, the fishermen started pulling the rope while chanting the mantra. After hours of tremendous effort, the giant fish, entrapped in the vine rope, was dragged to the shore. Suddenly, to everyone’s amazement, the whale vanished, and in its place stood Lord Subramanya, released by Lord Shiva from the curse. A temple for Lord Subramanya was built on the spot where the giant fish had been shored. That temple stands today as a living monument to remind us of the old story. The legend does not end there. Now Lord Shiva, in the guise of the old man, stepped forward and stood before the king, demanding the reward of the hand of the princess in marriage. The king, who had promised his only daughter to the champion who saved his people, was now trapped in a dilemma. He and his subjects were completely distraught. How could a father, especially as king, give his exquisite young daughter in marriage to an old man? The king begged him to ask for anything in the entire kingdom but his daughter. The old man calmly replied that a king must keep his promise and be truthful to his word. Lord Shiva and Goddess Parvati continued on their way, followed by the fisherfolk, finally reaching a spot where they stopped. As Lord Shiva stood facing east and Goddess Parvati faced west, the two became transformed into stone images. Chelluruna uru (the place reached) later became Chenganoor of the present day. In time a temple was constructed and daily worship was begun, when something very strange occurred. Whenever water was brought to the sanctum sanctorum to perform the worship, the priests found a fish in it. This made the performance of the daily worship impossible. In order to find a solution, the temple authorities made an astrological calculation and discovered the whole story of Lord Shiva, Goddess Parvati, and the curse of Lord Subramanya. The astrological forecast further revealed that the marriage ceremonies of the old man and the princess had never been conducted. According to the custom, the people of the Alappad coast, where Goddess Parvati had been born as a fishermaid, should come with dowry and other marriage presentations to Chenganoor in order to conduct the marriage. Subsequently the necessary preparations were made in Chenganoor and Alappad. The villagers of Alappad duly assembled the paraphernalia and travelled to Chenganoor to conduct the divine marriage ceremony. To this day, every year during the festival season, this custom is followed in memory of the ancient legend. The temple still remains a centre of attraction to thousands of devotees. A few decades ago an interesting incident took place in connection with this story. One year the people from the Alappad coast did not participate in the festival by observing the customary rules and preparation, thinking it meaningless and wasteful to spend a lot of money to travel all the way to Chenganoor. They thought, “Why should we cooperate in a festival which is conducted in a distant place?” Mysterious happenings immediately took place in the Chenganoor temple. The decorated elephant that was to carry the Lord’s idol in the procession stood still, refusing to take even a step. All efforts to make it move failed. Word was immediately sent to Alappad of this inauspicious occurrence, but too late. Smallpox had already broken out there. Realizing their foolish mistake and with deep remorse, the villagers made their way to Chenganoor without delay, bringing all the preparations for contributing to the festival according to the custom. Such is the ancient lore that is intimately interwoven with this coastal landscape and its people. Is it a wonder then that this sacred place has again become centre stage for a divine drama? 1 An alliance of five villages, the governing body overseeing local affairs. 2 Another name for Sri Muruga, the brother of Sri Ganesh.